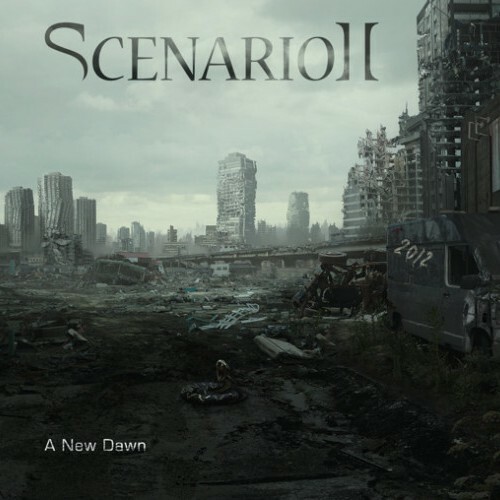 Scenario II is a Dutch band from Eindhoven. They describe their music as melodic dark death/thrash metal, which is inspired by In Flames, Arch Enemy, Dimmu Borgir and Amorphis. They have done gigs with bands like Volbeat, Dark Tranquillity, Testament and Orphanage. Some of my favourite bands, so A New Dawn tickled my interest. The description of the band is not too far from the truth. Especially the melodic death and gothic metal influences are there, with also some clear influences of symphonic black and traces of thrash metal when the speed limits get bumped up. One band that immediately came to mind is the sadly defunct Orphanage. The grunts are sometimes eerily similar to that of George Oosthoek, that I sometimes had to check if the Orphanage grunter wasn’t a guest on this album. This is not a bad thing by the way, since George has one of the best grunts of The Netherlands, so the vocals of Bas are more than okay in my book. Another band that Scenario shared similarities with in the mid-tempo, less symphonic parts is Amon Amarth. The sometimes groovy melodeath riffs in ‘Hysteria’ are good examples of this. Scenario II shows a lot of versatility on their second album. ‘A New Dawn’ has some authentic gothic metal chops, with a Myrthe who shows what her pipes are made off. While in for example ‘Rapture’ you hear some symphonic black metal in the vein of Dimmu Borgir passing by. These elements are mixed with all other aforementioned elements in almost every song. Technically it shows that all musicians involved know what they do and their skill levels are quite high. The problem only lays in this mixture is that the songs sometimes sound a bit too massive as if all influences needed to be cramped in one song. A bit more breathing room within the songs would serve them well. Big plus of this choice though is that you find a lot of variety on the album, which makes it interesting and could lure people back to it. A New Dawn is an album that shows quite some potential for this band, although it is hard for me to say how they’re going to evolve, because of the diversity and the surplus of influences they put in their music. They show the ability to write good songs (with ‘Hysteria’ as a personal favourite), but the songs should be a bit more focused. The above mentioned reason makes it sometimes hard to keep the attention to all the songs, writing some more simpler hooks could make a next album more memorable. Also the production could use some improvement, especially the drums sometimes feel like they were pasted to the music instead of it being integrated part. Despite this critique, it is a promising sophomore release and I think that Scenario II has it in itself to write a tremendous follow up. There is room for improvement, but also a lot of moments to enjoy. People who like their melodic death symphonic and are not afraid to listen to some other influences in their melodeath will have quite a good time with this disc.